Hope you are all doing really well! Like i said yesterday i was out last night for my friends 21st / leaving party as she is off traveling with her University and we had such an amazing evening. I had a few cheeky cocktails, a lovely meal and great company! 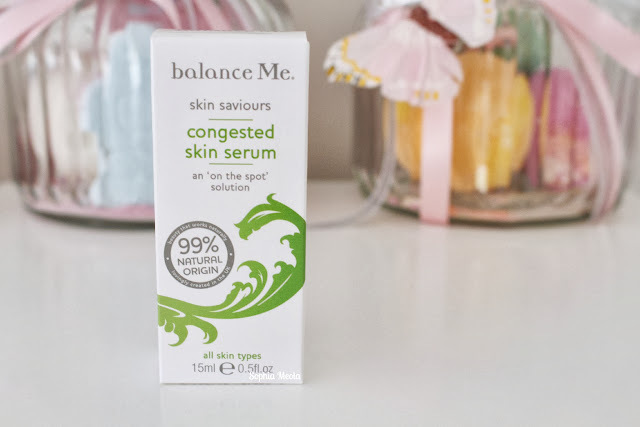 I have another Balance Me review for you today, i have really been enjoying trying out their products and seeing how they work for me. 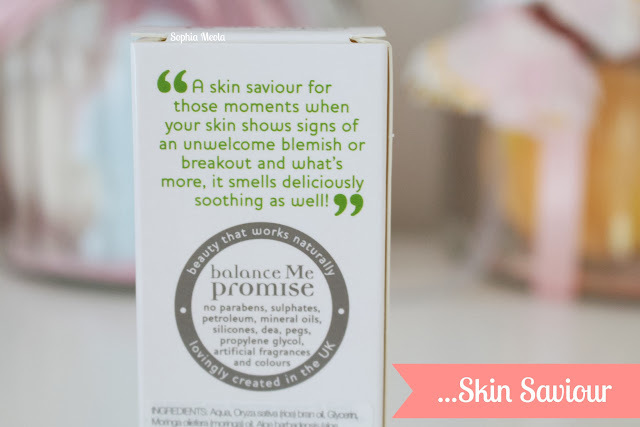 I don't know about you but i am forever having those 'bad skin days' where you skin sometimes needs some TLC. I usually find when i have somewhere nice to go fro an event or meeting is when my skin acts up the most...so typical yet so true - booo! 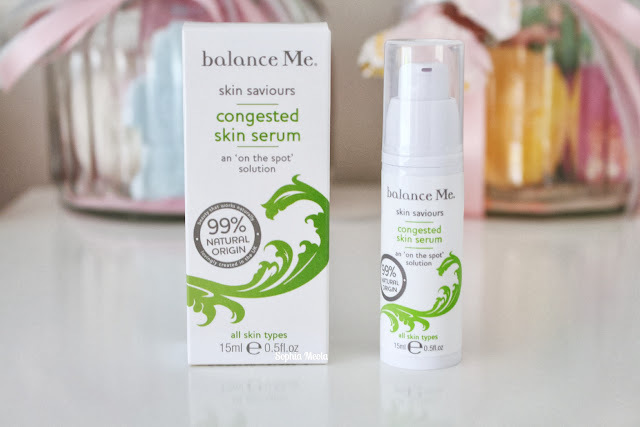 The Balance Me Congested Skin Serum is an 'on the spot' calming and balancing non-drying gel containing organic aloe vera and spruise knot, calming lavender and anti-bacterial may chang for those moments when your skin shows signs of an unwelcome blemish or breakout. I have been using this little gem for the past few weeks and i can literally see it working on my pesky breakouts, just like it says on the packaging it really is a little saviour! This is a super light weight serum that contains spruce knot, eucalyptus and lavender which are natural anti-bacterial and skin soothing treats. It has a really relaxing aromatic smell much like the Moisturising Hand Cream i review HERE. As long as i stick to a skincare routine i find that my skin can behave and be blemish free, however, i am only human and can sometimes forget certain steps in my routine (slap on the wrist) so having a spot treatment is a must in my beauty collection and skincare routine. It is quite a versatile formulation as you can use it as a on-the-spot treatment for pesky blemishes on all over areas on your face which need a little more loving. The packaging is quite simple yet chic and blends in well with the other Balance Me range. The beautiful forest green detailing on the packaging instantly makes me think of nature which is closely linked with the special natural ingredients within the products formula and as you can see there are 99% natural origin and is free from nasties which sometimes other products are the main causes of skin breakouts and so on. I also like how there is not too much going on and you are able to see what the product is and scattered with a few different products would look really quaint on display. I also really like that it is a dinky bottle which is great if you are on the go and traveling. The Congested Skin Serum is something i am constantly using right now and i have found a difference in breakout healing time hugely. I actually applied some this evening after getting ready for bed during my night time skincare routine and it feels great on the skin. I'm not sure whether its just me thinking and knowing it's working but when you first apply it you feel it working haha - that could be just me though! 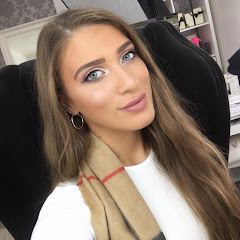 I love how i can relax and let it work it's magic throughout the night and wake up the clearer and more radiant skin - it really is a saviour product! You simply apply it directly onto distressed areas on the skin, breakouts or congested areas on the skin and let it work it's magic. You all know this but make sure you apply it with clean hands, it will speed up healing time and ensure no bacteria is spread around the broken-out area :D It does not specify how frequently the product can be used but i have been using it morning and evening to get the best results out of the product, especially when i am trying to shift a big'n haha. Hope you all liked this Balance Me review, i would love to know what you think about it and what your go to hand cream is! Like always lovelies, if you have any questions, requests or if you just want a chat you can contact me on my social media or leave me a comment below. I love hearing from you and i make sure to read every single comment...they really make my day! Congratulations on your listing in Best New Beauty Blogs! What an awesome achievement! This sounds like a really great product. Would you say it deals with black heads as well? I struggle with them more than anything. I really need to pick this up! It sounds so wonderful!